The longest and toughest day today as the team cycled across the country with a whopping 91-miles over undulating terrain. Moving from the east to the west coast of Thailand we used a busier main road than previous days but there was barely a vehicle that didn’t beep us with encouragement as we pumped out the miles. Plenty of opportunities today for team pursuit sprints as well as some decent hills to get the lungs gasping for air. We smashed out an impressive 17mph average as a group, which is a superb effort given the distance, heat and terrain. Meandering and undulating roads through a spectacular forest made the closing stages of this cycling leg a cyclist’s dream, ending with a mammoth climb which Hayley and Lorraine can claim bragging rights in the bar tonight! Team are shattered but extremely proud of themselves and so they should be! 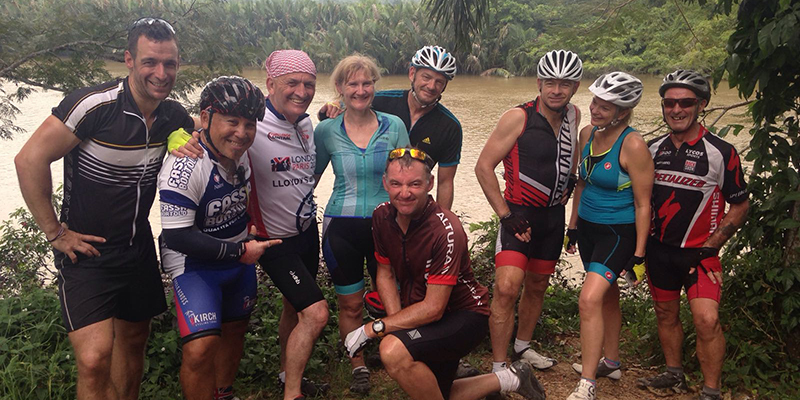 Learn more about CC’s Thailand Cycling Tour – Bangkok to Phuket.